If you missed Monday’s Horticulture Section seminar, Growing the lost crops of eastern North America: Developmental plasticity in plant domestication with Natalie Mueller, post-doctoral fellow, Horticulture Section, it is available online. 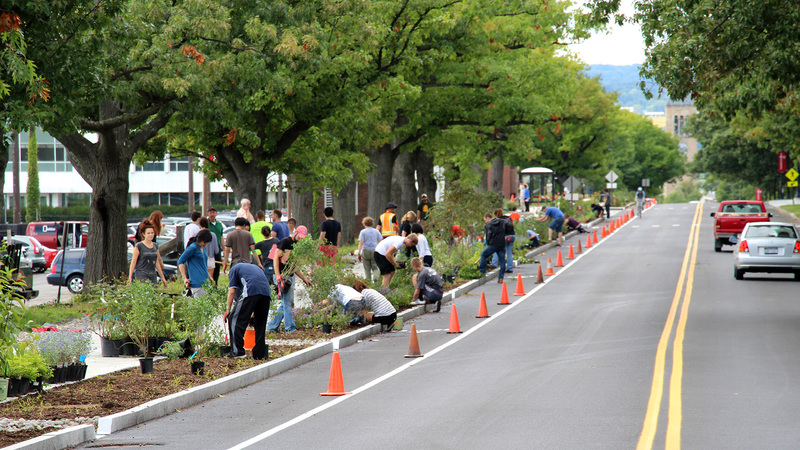 Above: Students in Creating the Urban Eden: Woody Plant Selection, Design, and Landscape Establishment (PLHRT/LA 4910/4920) planted more than 1,000 feet of beds along Tower Road from Plant Science Building to Stocking Hall with nearly 1,000 woody shrubs in September 2014. 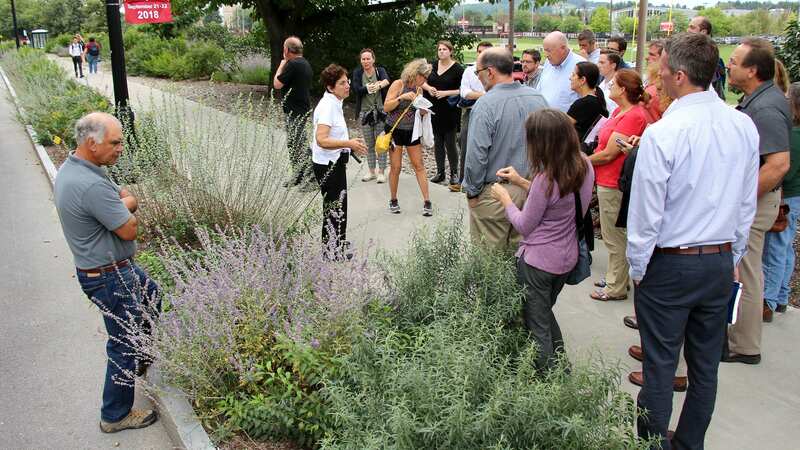 Nearly 50 landscape architects, environmentalists, educators and others visited Cornell September 17 to learn about the ecosystem benefits of bioswales and tour the runoff-filtering structures on campus. Bioswales channel water from streets and parking lots into areas where the water can infiltrate into the groundwater instead of entering storm drains and waterways. In the process, they keep sediment and other pollutants out of streams and lakes, reduce flooding and prevent streambank erosion. They can also provide aesthetic benefits, habitat for pollinators and other ecosystem services, says Nina Bassuk, director of the Urban Horticulture Institute in the Horticulture Section of the School of Integrative Plant Science, who led the program along with Peter Trowbridge, Trowbridge Wolf Michaels Landscape Architects and retired professor from the Department of Landscape Architecture. Bassuk’s work has focused on the ‘bio’ aspects of bioswales, researching which plants are best-suited for the tough conditions they face. “We’re testing plants that can tolerate both saturated soil and periodic drought,” says Bassuk. “They also need to be able tolerate salty soil and bounce back from damage when snow and ice are piled over them during winter.” Woody shrubs that can be cut back to the ground and regrow quickly in spring are especially good candidates. The landscape professionals saw many of those plants in three bioswales they toured while on campus, including northern bayberry (Morella pensylvanica), shining sumac (Rhus coppalina), creeping willow (Salix repens), seaberry (Hippophae rhamnoides), ) buttonbush (Cephalanthus occidentalis) and others. Those three bioswales – the quarter-mile-long Tower Road bioswale, the Rice Bowl bioswales adjacent to the parking lot next to Rice Hall, and the Cornell Botanic Garden bioswale next to the Nevin Welcome Center parking lot – are featured on the new Sustainable Landscapes Trail developed by the Land Team of the President’s Campus Sustainability Committee. For more information on bioswales, download Woody Shrubs for Stormwater Retention Practices at the Urban Horticulture Institute website. Above: Nina Bassuk explains bioswale plant selection to landscape professionals touring the Tower Road bioswale. The newest offering from Cornell’s grape breeders is a fruit that’s big, bold and comes with a towering history. 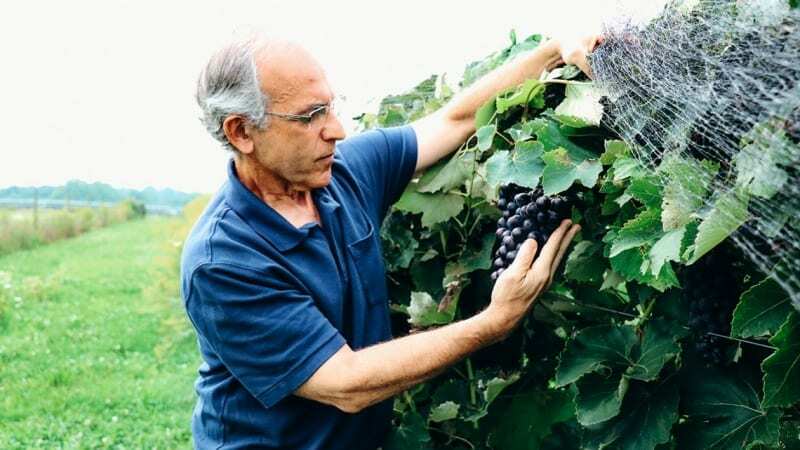 Those factors led the grape’s breeders to name the new variety Everest Seedless, a nod to the celebrated Nepalese mountain, said Bruce Reisch ’76, professor of horticulture in the College of Agriculture and Life Sciences, and grape breeder with Cornell AgriTech in Geneva, New York. “We were looking to develop very flavorful grapes with large berries and large clusters, and we’ve achieved that with Everest Seedless,” Reisch said. 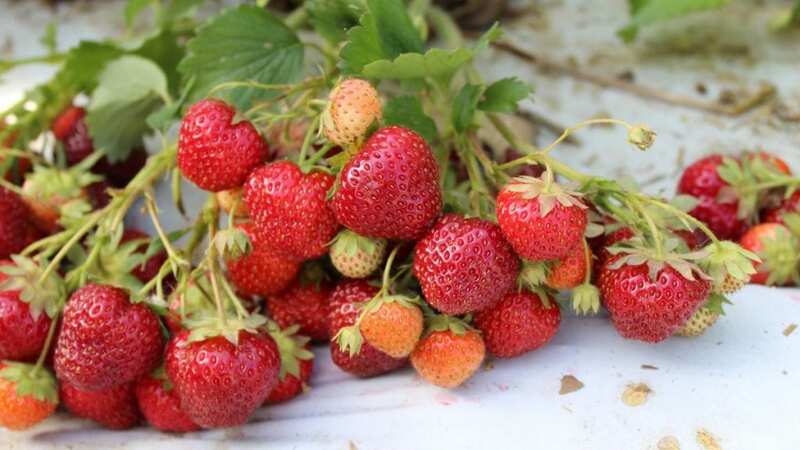 The new variety is a cold-tolerant, blue-colored Concord-type, with berries that weigh up to 7 grams – roughly twice the size of the traditional Concord. It is also the first truly seedless Concord-type grape ever released. It’s intended as a table grape – meant primarily for eating fresh, rather than using for jams, juice or wine, as most American Concords are used. The honeysuckle, barberry and multiflora rose in the Henry A. Smith Woods in Trumansburg, N.Y., were quaking in their boots September 6. The reason? New Plant Sciences majors enrolled in Collaboration, Leadership, and Career Skills in the Plant Sciences (PLSCI 1110) spent the afternoon roguing out these invasive species from this treasured remnant of old growth forest. Every fall, instructors Marvin Pritts and Leah Cook involve the students in a service learning project as a way to give back to the local community. 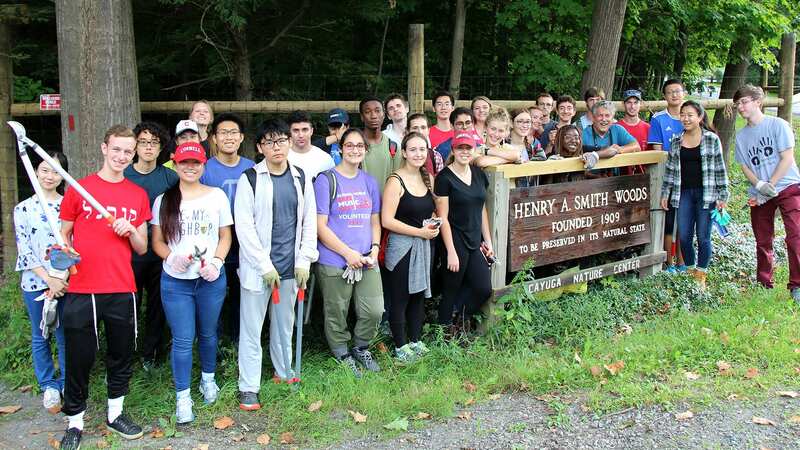 Previous projects included making improvements to the Habitat Trail outside of Trumansburg, planting mums at the Ithaca Children’s Garden, and designing and installing a campus garden. 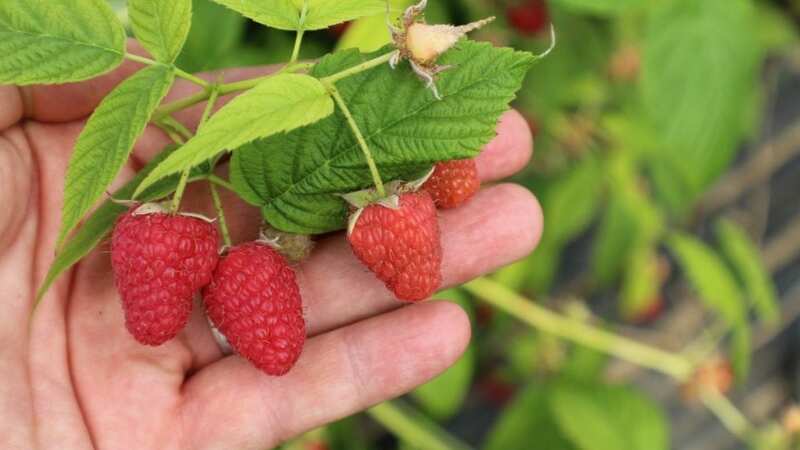 Cornell’s berry breeding program is releasing two new varieties, which will be available for planting in spring 2019: a strawberry, Dickens, and a raspberry, Crimson Treasure. Crimson Treasure produces large fruit with vibrant colors and maintains peak flavor and texture for longer. See the application and instructions that spell out the procedure for applying. Basically it is quite simple. Submit a written proposal to the Dreer Committee by the deadline (March 4, 2019 in this cycle), which is followed by an informal interview, generally in a week or two. The faculty receives the recommendation of the Dreer Committee and votes on the nominee. Please look into this opportunity seriously. It can be taken as a summer and a semester’s leave or a year’s leave of absence during school or upon graduation. If you would like to talk over a potential idea for the Dreer with a member of the Committee (and we encourage you to do so), please contact Nina Bassuk (Horticulture) Valerie Aymer (Landscape Architecture) or Marvin Pritts (Horticulture). A memorial celebration of the life of Carl F. Gortzig ’52 will be held Sunday, Sept. 23 at 2 p.m. at the Brian C. Nevin Welcome Center of Cornell Botanic Gardens. 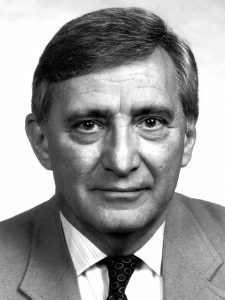 Gortzig, professor emeritus and chair of the former Department of Floriculture and Ornamental Horticulture, died June 2 in Ithaca at age 87. 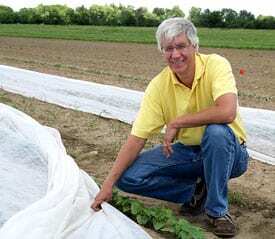 Gortzig served as the Elizabeth Newman Wilds Director of Cornell Plantations (now Cornell Botanic Gardens) from 1993-95, after a previous stint as acting director in 1989, and four years as chair of the Plantations Advisory Board from 1980-84. In addition to his enduring support for the Botanic Gardens, Gortzig was devoted to the field of horticulture, working closely with the floriculture industry in New York state. His efforts were recognized in 1989 with the granting of the George L. Good Gold Medal of Horticulture, the highest honor of the New York State Nursery and Landscape Association. He also cared deeply about the students he taught and advised, and in 2002 a former advisee, Joanna Beitel ’92, established the Carl Gortzig scholarship in his honor. Gortzig recognized the importance of local cultural organizations, and served in leadership positions on the boards of the History Center in Tompkins County, The Tompkins County Public Library, and the Cayuga Chamber Orchestra. He and his wife Jean were also devoted fans of the Cornell men’s basketball team. He served in the U.S. Army as a first lieutenant from 1952-54; taught biology, botany and math at the McKinley Vocational High School in Buffalo from 1954-55; worked as an Erie County associate agricultural agent from 1955-64; and was employed by Cornell’s College of Agriculture and Life Sciences as an admissions counselor from 1957 -58. He joined Cornell’s faculty in 1965, earned tenure in 1971 and was promoted to full professor in 1978. He is survived by his devoted and loving wife of 55 years, Jean. Those planning to attend the memorial are asked to respond in advance to dr14@cornell.edu with the subject heading Gortzig Memorial. Memorial gifts may be directed to Cornell Botanic Gardens.